Intermittent fasting, a common dietary strategy, has gained popularity in the past few years. Many people have implemented this type of diet to assist in trimming fat, without understanding the effects that it can have on strength and endurance performance. There are many ways to implement this type of diet (e.g. 16 hours fasted/8 hours fed, 20 hours fasted/4 hours fed, alternate day 24 hour fasting, etc. ), which can lead to differences in results. This is because depending on the type and length of intermittent fast that is chosen, the total daily caloric intake is likely to change. Does whey protein actually help you gain muscle faster in strength training? There is so much hype about how to, according to normal everyday language, “get swole” faster. Of course, it is widely accepted that the type of training someone does affects how you accumulate muscle mass. For instance, endurance training such as running is going to yield different results than heavy weight lifting in terms of muscle mass gains. Now, there is a wide range of studies that have been done to investigate how whey protein assists in muscle growth with strength training exercises. To expand how this emphasis on supplementation has been such a fast growing topic, the first gym I ever gained a membership in my later teenage years very much surprised me in what the fitness trainers emphasized in terms of my goal to build more lean muscle mass. Initially, the fitness trainers at this gym asked me about what kind of exercises I believed would enhance my muscle mass the most. This was talked about for maybe 30 seconds. The conversation shifted immediately from what types of exercises are important for accumulating muscle mass to what supplements I was taking pre and post-workout, specifically whey protein. We discussed this for approximately 20-30 minutes. It came to my surprise that the emphasis of this conversation was placed on the whey protein supplementation I was going to do versus the type of exercises I was going to do. In my mind, the emphasis of the conversation would have been flipped. Ever since, I have always had the lingering question in my head… does whey protein supplementation make a significant difference in the rate at which you gain muscle mass in strength training? Given the impact that the diagnosis and treatment of cancer has on women, there has been a lot of research out there on what causes it and how to prevent it. Exercise is a huge topic in prevention and living a healthy life style. Diet is also another important factor that can help prevent breast cancer, although there is not as much research out there as there is for exercise and maintaining a healthy weight. For post- menopausal women, it is just as important to stay active and to maintain a healthy weight as it is for pre-menopausal women. Weight gain and being obese have been shown to be risk factors in developing some forms of post-menopausal breast cancer (Harvie 2015). Exercise and a healthy diet post-menopause are important factors in the prevention of breast cancer. Individuals that are over-weight tend to want a diet that will show fast results. When doing quick research online, they may find that high-protein low-fat diets will give them the results they want to see. In order for a high protein diet to have its full effect, exercise needs to be coupled with it. Verreijen and team found that a high protein diet did not significantly decrease the amount of free fat mass in sedentary individuals. They did find that a high protein diet paired with resistance training did not significantly lower the amount of free fat mass in individuals that were previously obese. Autism, also known as autism spectrum disorder (ASD), refers to a broad range of symptoms or conditions that are represented by challenges in the areas of social skills, repetitive behaviors, speech and nonverbal communication (Autism Speaks, 2018). Each person on the autism spectrum is different from one another, this is because there are many subtypes to the autism spectrum (Autism Speaks, 2018). What this means, is that every individual with autism has unique challenges and strengths, thus the type of treatment must be specific to the individual. There are many different treatments out there for individuals on the autism spectrum. There are pharmacological interventions such as psycho-stimulants, atypical anti-psychotic drugs, and antidepressants. There are also non-pharmacological therapies such as complementary and integrative medicine, music therapy, cognitive-behavioral therapy, and social behavior therapies (Sharma et al, 2018). In this article I want to show another approach to a non-pharmacological intervention; the use of yoga as an intervention for children diagnosed with autism spectrum disorder. Before going too far into the topic, I want to cover some helpful terminology and abbreviations that will be mentioned. There’s no better way to begin your day than by drinking a hot cup of coffee before enjoying a nice workout. Aside from being a delightful beverage that’s part of your morning routine, have you ever stopped and thought about all the benefits that the caffeine you’re consuming provides? Caffeine is found in many foods and beverages and over 90% of the US population consumes it on a regular basis (Mawer, 2016). Foam rolling’s recent rise in popularity is in response to the desire for improved muscle recovery and flexibility in trained individuals, like you. Now that the spotlight is on it, how do you get started? Let’s start with how you actually foam roll and then we can talk about its benefits. Has increasing your step count to 10,000 steps not helped you achieve the weight loss you want to achieve? Are you fed up with personal fitness trainer and gym costs without seeing any real results? The real results to help lose fat may come from a type of exercise called HIIT, or high-intensity interval training. How does your blood adapt to high altitudes? What is different when you’re at altitude compared to sea level? Oxygen is an essential molecule for the human body to carry out its normal function. When we breath in, oxygen can enter our lungs and make its way into our circulating blood system through gas exchange between alveoli, small air filled sacs in the lungs, and capillaries, or small blood vessels. When the oxygen enters our blood, it binds to hemoglobin, or the oxygen carrying molecule of red blood cells. These red blood cells travel through our circulatory system and deliver the oxygen to working tissues. 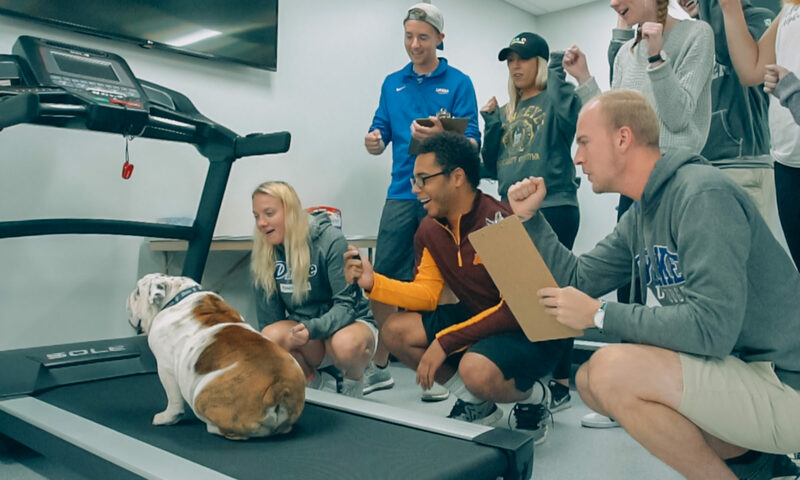 Welcome to the new website for Drake University’s Exercise Physiology class! This website is designed to highlight the work students have done researching and writing about topics related to exercise training and performance, fitness, health, physiology, and nutrition. Each blog post is reviewed for content and accuracy by peers in the class and by the instructor. Our goal is for this website to be a platform for our students to provide current, interesting, and scientifically-informed exercise physiology content written for a general audience.